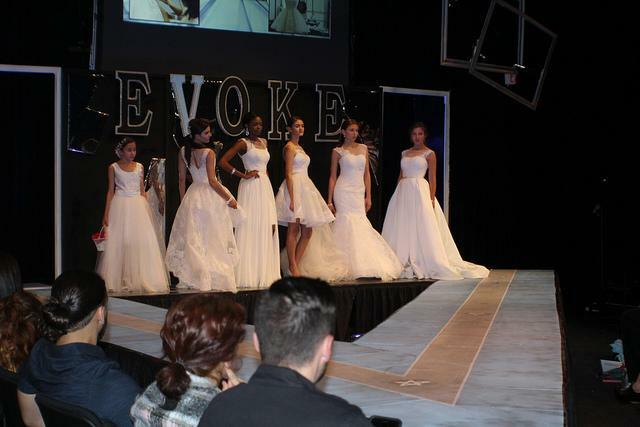 Last Friday, American River College debuted its annual spring fashion show EVOKE, which featured 16 student designers. “I think the show evoked the inner fashion in all of us tonight, and the designers did a wonderful job,” said chairperson Bonnie Spencer. The show is produced by the promotions class, which is Fashion 393, and features student designers enrolled in Fashion 382. Over 80 models were featured including both professionals and students who were able to showcase the student designers’ collections. Also featured was alumnus fashion designer Saul Latvanen, who featured his New York Fashion Week collection. EVOKE was featured on Good Morning America at 11 a.m., where six judges showed up to choose best of show, most marketable, best construction and best model. The show saw a huge turnout and sold out every ticket for the 5:30 p.m. and 7 p.m. slots. When asked how the show turned out and the student success of putting on the show, instructor Gail Russell had many positive things to say. “I believe the show turned out very well and the students spent hundreds of hours, at least 25 hours a week putting this show together,” said Russell. The designers had from the beginning of the semester to design and construct their collection, student designer Kayla Mccall said. ”It took me the whole five months, I was still designing till 3 a.m this morning of the show,” she added. EVOKE not only consisted of student designers and fashion students who produced for the event, it also had over 80 models hand picked by each designer and some had a few words about the show. “Oh man, I felt so nervous seeing that this is my first show and I was just really honored to be chosen to wear Igna Linko’s design ‘Native Sisters.’ I had a blast,” said model and ARC student Navneet Grewal. Be the first to comment on "ARC hosts 15th annual fashion show"